“…You will be given one bag, filled with all the necessary tools and supplies you will need to navigate your way through a well known wild place. This challenge will test your ability to compass your way, given bearings and clues, identify trees and shrubs in winter conditions (bark and buds) and solve riddles and questions. Every time you complete a task, you will receive a ‘memory’ card; an event that we shared this past year together that is important to shaping our relationship. Once you receive all the cards, you will assemble them in a book to illustrate our 2012 year together. You will receive a treasure map, a compass, clues upon finding each marker, warm clothes and boots, a pencil/pen, a blank notepad, a Trees of Canada i.d. book, and a book bag. All clues will be hanging on objects from brown hemp string. 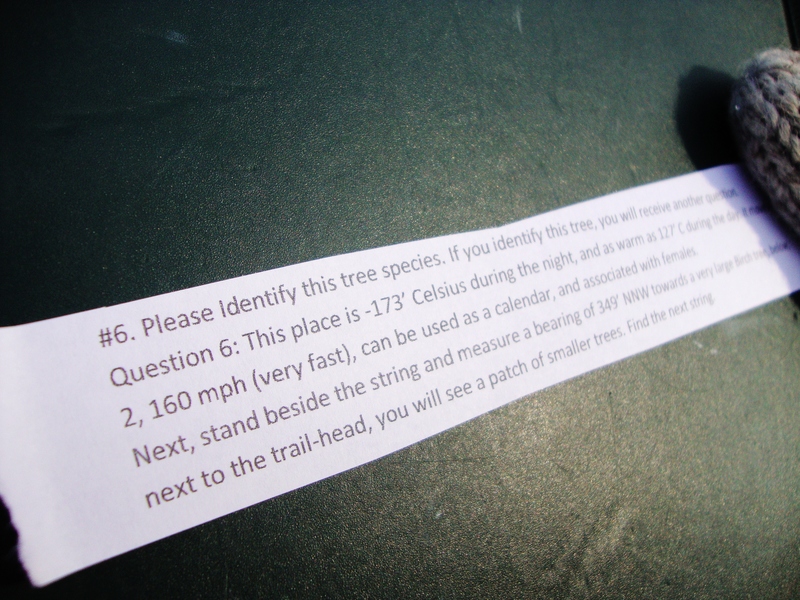 Most are in trees, and to get your next clue, you must correctly identify the tree that is marked. Keep your eyes open! Have fun, and don’t get lost. You have 4 lifelines and if you need extra help as you can’t clearly see the marker, just ask. I received this on a piece of paper the morning after we returned from Windsor, and before we set out to the Trent Sanctuary trails where we love to go hiking and wild-crafting together. I had no idea what to expect but as soon as Adam gave me the first bearing on the compass, I was absolutely giddy with excitement, like a child being set free to run through the forest! It’s pretty difficult to see hemp string blowing in the wind against sun reflecting snow, but I found the first number. My first task then was to identify the tree correctly, using our Trees of Canada book if needed, in order to be given a further trivia question. Sometimes the questions were word scrambles, which I proved to be horrible at (thankfully Adam is good at giving heeeavy hints haha), some were words or factual information clues about something, others tested my knowledge of familiar herbs and their uses, artists or people we know, and each question directly corresponded to a hand drawn illustration of a memory we have shared together this year. This is the most amazing part, I looove Adam’s drawings so much (it began with a bunny he drew in college, hahaha cutest thing I have ever seen) and now I have 17 individual cards that I will put together into a beautiful book so I can always have those memories close to my heart. My favourite portion of the adventure was Part 2- Connections. This is about the time my toes started to freeze but also when my heart began to melt- Adam’s instructions lead us through a bog and a fallen poplar forest where he shared stories about the mystical creatures that live in the woods. We made a blessing to the sleeping earth and he placed attention on the amazing syncronistic relationship between life and death, decaying feeding the living, even beneath the blanket of snow. To be granted my 15th question I had to collect and trade in fallen Red Maple buds, Bugle Weed seeds, Birch bark and a mushroom. We set intentions for the year ahead and visited familiar plant friends that provide for us in the summer months. We were in the forest for just over 3 hours, I answered 20 questions and we travelled about 4 km. I felt like I emerged from an enchanted journey, awake and even further connected to Adam. I still can’t believe that he gifted this to me, the work that went into it is incredible and how he put it together resonated deeply with me on a soulful level. I am so thankful and blessed to have him by my side. He has absolutely enriched my being and has contributed greatly to my personal and spiritual growth. I would not be who I am today, with the knowledge I have if it wasn’t for his vibrant and fierce existence and support. With him I am able to move freely, without doubt and fear, towards the horizon of the path that I am on- despite it not bearing any footprints of others around me. With him I feel love, I love, and that love has deepened through this experience. P.S. I looooooooooooooove your writing. Please keep blogging.